Covalence first uses a set of 50 criteria inspired by the Global Reporting Initiative’s sustainability reporting guidelines. These criteria serve to classify the narrative content which is gathered thanks to our semi-automated search process. 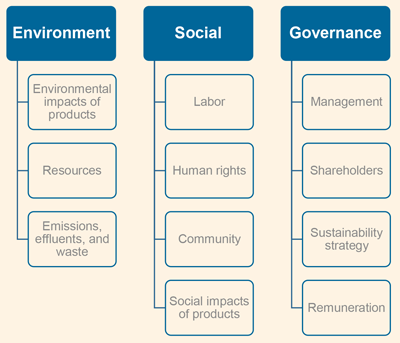 The data is then recoded with hundreds of topics and sub-topics and organized into 11 dimensions within 3 categories: Environment, Social, Governance. The data is also classified with the 17 Sustainable Development Goals to show companies’ mapping to the SDGs to provide insightful material for impact analysis and to support thematic investment strategies. Finally, Covalence data can also be classified with other metrics such as the Principles of the UN Global Compact or the Peacebuilding Business Criteria developed by the PeaceNexus foundation.